The England cricket team represents England and Wales in international cricket. Since 1997 it has been governed by the England and Wales Cricket Board (ECB), having been previously governed by Marylebone Cricket Club (the MCC) from 1903 until the end of 1996. England, as a founding nation, is a full member of the International Cricket Council (ICC) with Test, One Day International (ODI) and Twenty20 International (T20I) status. Until the 1990s, Scottish and Irish players also played for England as those countries were not yet ICC members in their own right. England and Australia were the first teams to play a Test match (between 15–19 March 1877), and these two countries together with South Africa formed the Imperial Cricket Conference (predecessor to today's International Cricket Council) on 15 June 1909. England and Australia also played the first ODI on 5 January 1971. England's first T20I was played on 13 June 2005, once more against Australia. As of 12 March 2019[update], England has played 1010 Test matches, winning 365 and losing 300 (with 345 draws). The team has won The Ashes on 32 occasions. England has played 726 ODIs, winning 362, and its record in major ODI tournaments includes finishing as runners-up in three Cricket World Cups (1979, 1987 and 1992), and in two ICC Champions Trophys (2004 and 2013). England has also played 108 T20Is, winning 53. They won the ICC World Twenty20 in 2010, and were runners-up in 2016. As of 12 March 2019[update], England are ranked fifth in Tests, first in ODIs and third in T20Is by the ICC. Though the team and coaching staff faced heavy criticism after their Group Stage exit in the 2015 Cricket World Cup, it has since adopted a more aggressive and modern playing style in ODI cricket, under the leadership of captain Eoin Morgan and head coach Trevor Bayliss. The first recorded incidence of a team with a claim to represent England comes from 9 July 1739 when an "All-England" team, which consisted of 11 gentlemen from any part of England exclusive of Kent, played against "the Unconquerable County" of Kent and lost by a margin of "very few notches". Such matches were repeated on numerous occasions for the best part of a century. In 1846 William Clarke formed the All-England Eleven. This team eventually competed against a United All-England Eleven with annual matches occurring between 1847 and 1856. These matches were arguably the most important contest of the English season if judged by the quality of the players. The first overseas tour occurred in September 1859 with England touring North America. This team had six players from the All-England Eleven, six from the United All-England Eleven and was captained by George Parr. With the outbreak of the American Civil War, attention turned elsewhere. English tourists visited Australia in 1861–62 with this first tour organised as a commercial venture by Messrs Spiers and Pond, restaurateurs of Melbourne. Most matches played during tours prior to 1877 were "against odds", with the opposing team fielding more than 11 players to make for a more even contest. This first Australian tour were mostly against odds of at least 18/11. The tour was so successful that George Parr led a second tour in 1863–64. James Lillywhite led a subsequent England team which sailed on the P&O steamship Poonah on 21 September 1876. They played a combined Australian XI, for once on even terms of 11 a side. The match, starting on 15 March 1877 at the Melbourne Cricket Ground came to be regarded as the inaugural Test match. The combined Australian XI won this Test match by 45 runs with Charles Bannerman of Australia scoring the first Test century. At the time, the match was promoted as James Lillywhite's XI v Combined Victoria and New South Wales. The teams played a return match on the same ground at Easter, 1877, when Lillywhite's team avenged their loss with a victory by four wickets. The first Test match on English soil occurred in 1880 with England victorious; this was the first time England fielded a fully representative side with W.G. Grace included in the team. In Affectionate Remembrance of ENGLISH CRICKET, which died at the Oval on 29th AUGUST 1882, Deeply lamented by a large circle of sorrowing friends and acquaintances R.I.P. N.B. – The body will be cremated and the ashes taken to Australia. 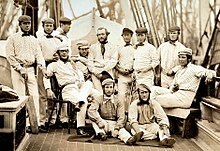 As a result of this loss the tour of 1882–83 was dubbed by England captain Ivo Bligh as "the quest to regain the ashes". England with a mixture of amateurs and professionals won the series 2–1. Bligh was presented with an urn that contained some ashes, which have variously been said to be of a bail, ball or even a woman's veil and so The Ashes was born. A fourth match was then played which Australia won by 4 wickets but the match was not considered part of the Ashes series. England dominated many of these early contests with England winning the Ashes series 10 times between 1884 and 1898. During this period England also played their first Test match against South Africa in 1889 at Port Elizabeth. England won the 1890 Ashes Series 2–0, with the third match of the series being the first Test match to be abandoned. England lost 2–1 in the 1891–92 series, although England regained the urn the following year. England again won the 1894–95 series, winning 3–2 under the leadership of Andrew Stoddart. In 1895–96 England played Test South Africa, winning all Tests in the series. The 1899 Ashes series was the first tour where the MCC and the counties appointed a selection committee. There were three active players: Lord Hawke, W. G. Grace and Herbert Bainbridge who was the captain of Warwickshire. Prior to this, England teams for home Tests had been chosen by the club on whose ground the match was to be played. England lost the 1899 Ashes series 1–0, with WG Grace making his final Test appearance in the first match of the series. The start of the 20th century saw mixed results for England as they lost four of the eight Ashes series between 1900 and 1914. During this period England lost their first series against South Africa in the 1905–06 season 4–1 as their batting faltered. England lost their first series of the new century to Australia in 190-02 Ashes. Australia also won the 1902 series, which was memorable for exciting cricket, including Gilbert Jessop scoring a Test century in just seventy minutes. England regained the Ashes in 1904 under the captaincy of Plum Warner. R.E. Foster scored 287 on his debut and Wilfred Rhodes took 15 wickets in a match. In 1905–06 England lost 4–1 against South Africa. England avenged the defeat in 1907, when they won the series 1–0 under the captaincy of R.E. Foster. However, they lost the 1909 Ashes series against Australia, suing 25 players in the process. England also lost to South Africa, with Jack Hobbs scoring his first of fifteen centuries on the tour. England toured Australia in 1911–12 and beat their opponents 4–1. The team included the likes of Jack Hobbs, Frank Woolley, Sydeney Barnes and Wilfried Rhodes. England lost the first match of the series but bounced back and won the next four Tests. This proved to be the last Ashes series before the war. Nine Tests provide a surfeit of cricket, and contests between Australia and South Africa are not a great attraction to the British public. With Australia sending a weakened team and the South African bowlers being ineffective England dominated the tournament winning four of their six matches. The Australia v South Africa match, at Lord's, was notable for a visit by King George V, the first time a reigning monarch had watched Test cricket. England went on one more tour against South Africa before the outbreak of World War I.
England's final tour before the outbreak of World War One saw England beat South Africa 4–0. Sydney Barnes took 49 wickets in the series. England's first match after the war was in the 1920–21 season against Australia. Still feeling the effects of the war England went down to a series of crushing defeats and suffered their first whitewash losing the series 5–0. Six Australians scored hundreds while Mailey spun out 36 English batsmen. Things were no better in the next few Ashes series losing the 1921 Ashes series 3–0 and the 1924–5 Ashes 4–1. England's fortunes were to change in 1926 as they regained the Ashes and were a formidable team during this period dispatching Australia 4–1 in the 1928–29 Ashes tour. On the same year the West Indies became the fourth nation to be granted Test status and played their first game against England. England won each of these three Tests by an innings, and a view was expressed in the press that their elevation had proved a mistake although Learie Constantine did the double on the tour. In the 1929–30 season England went on two concurrent tours with one team going to New Zealand (who were granted Test status earlier that year) and the other to the West Indies. Despite sending two separate teams England won both tours beating New Zealand 1–0 and the West Indies 2–1. The 1930 Ashes series saw a young Don Bradman dominate the tour, scoring 974 runs in his seven Test innings. He scored 254 at Lord's, 334 at Headingley and 232 at the Oval. Australia regained the Ashes winning the series 3–1. As a result of Bradman's prolific run-scoring the England captain Douglas Jardine chose to develop the already existing leg theory into fast leg theory, or bodyline, as a tactic to stop Bradman. Fast leg theory involved bowling fast balls directly at the batsman's body. The batsman would need to defend himself, and if he touched the ball with the bat, he risked being caught by one of a large number of fielders placed on the leg side. English cricket team at the Test match held at the Brisbane Exhibition Ground. England won the match by a record margin of 675 runs. Bodyline bowling assumed such proportions as to menace best interests of game, making protection of body by batsmen the main consideration. Causing intensely bitter feeling between players as well as injury. In our opinion is unsportsmanlike. Unless stopped at once likely to upset friendly relations existing between Australia and England. Later, Jardine was removed from the captaincy and the laws of cricket changed so that no more than one fast ball aimed at the body was permitted per over, and having more than two fielders behind square leg was banned. England's following tour of India in the 1933–34 season was the first Test match to be staged in the subcontinent. The series was also notable for Morris Nichols and Nobby Clark bowling so many bouncers that the Indian batsman wore solar topees instead of caps to protect themselves. Australia won the 1934 Ashes series 2–1 and kept the urn for the following 19 years. Many of the wickets of the time were friendly to batsmen resulting in a large proportion of matches ending in high scoring draws and many batting records being set. England drew the 1938 Ashes, meaning Australia retained the urn. England went into the final match of the series at The Oval 1–0 down, but won the final game by an innings and 579 runs. Len Hutton made the highest ever Test score by an Englishman, making 364 in England first innings to help them reach 903, their highest ever score against Australia. The 1938–39 tour of South Africa saw another experiment with the deciding Test being a timeless Test that was played to a finish. England lead 1–0 going into the final timeless match at Durban. Despite the final Test being 'timeless', the game ended in a draw after 10 days as England had to catch the train to catch the boat home. A record 1,981 runs were scored, and the concept of timeless Tests was abandoned. England went on one final tour of the West Indies in 1939 before World War II, although a team for an MCC tour of India was selected more in hope than expectation of the matches being played. Test cricket resumed after the Second World War in 1946, and England won their first match back against India. However, they struggled in the 1946–1947 Ashes series, losing 3–0 in Australia under Wally Hammond's captaincy. England beat South Africa 3–0 in 1947 with Dennis Compton scoring 1,187 runs in the series. The 1947–48 series against the West Indies was another disappointment for England, with the side losing 2–0 following injuries to several key players. England suffered further humiliation against Don Bradman's invincible in the 1948 Ashes series. Len Hutton was controversially dropped for the third Test, and England were bowled out for just 52 at The Oval. The series proved to be Bradman's final Ashes series. In 1948–49, England beat South Africa 2–0 under the captaincy of George Mann. The series included a record breaking stand of 359 between Len Hutton and Cyril Washbrook. The decade ended with England drawing the Test series against New Zealand, with every match ending in a draw. Their fortunes changed on the 1953 Ashes tour as they won the series 1–0. England did not lose a series between their 1950–51 and 1958–59 tours of Australia and secured famous victory in 1954–55 under the captaincy of Peter May, thanks to Frank 'Typhoon' Tyson whose 6–85 at Sydney and 7–27 at Melbourne are remembered as the fastest bowling ever seen in Australia. The 1956 series was remembered for the bowling of Jim Laker who took 46 wickets at 9.62 which included bowling figures of 19/90 at Old Trafford. After drawing to South Africa, England defeated the West Indies and New Zealand comfortably. The England team then left for Australia in the 1958–59 season with a team that had been hailed as the strongest ever to leave on an Ashes tour but lost the series 4–0 as Richie Benaud's revitalised Australians were too strong, with England struggling with the bat throughout the series. On 24 August 1959, England inflicted its only 5–0 whitewash over India. All out for 194 at The Oval, India lost the last test by an innings. England's batsman Ken Barrington and Colin Cowdrey both had an excellent series with the bat, with Barrington scoring 357 runs across the series and Cowdrey scoring 344. The early and middle 1960s were poor periods for English cricket. Despite England's strength on paper, Australia held the Ashes and the West Indies dominated England in the early part of the decade. Peter May stood down as captain in 1961 following the 1961 Ashes defeat. Ted Dexter succeeded him as captain but England continued to suffer indifferent results. In 1961/62 they beat Pakistan, but also lost to India. The following year saw England and Australia tie the 1962/3 Ashes series 1–1, meaning Australia retained the urn. Despite beating New Zealand 3–0, England went on to lose to the West Indies, and again failed in the 1964 Ashes, losing the home series 1–0, which marked the end of Dexter's captaincy. However, from 1968 to 1971 they played 27 consecutive Test matches without defeat, winning 9 and drawing 18 (including the abandoned Test at Melbourne in 1970–71). The sequence began when they drew with Australia at Lord's in the Second Test of the 1968 Ashes series and ended in 1971 when India won the Third Test at the Oval by 4 wickets. They played 13 Tests with only one defeat immediately beforehand and so played a total of 40 consecutive Tests with only one defeat, dating from their innings victory over the West Indies at The Oval in 1966. During this period they beat New Zealand, India, the West Indies, Pakistan and, under Ray Illingworth's determined leadership, regained The Ashes from Australia in 1970–71. The 1970s, for the England team, can be largely split into three parts. The early 70s saw Ray Illingworth's side dominate world cricket winning the Ashes away in 1971 and then retaining them at home in 1972. The same side beat Pakistan at home in 1971 and played by far the better cricket against India that season. However, England were largely helped by the rain to sneak the Pakistan series 1–0 but the same rain saved India twice and one England collapse saw them lose to India. This was, however, one of (if not the) strongest England team ever with Boycott, Edrich, D'Oliveira, Amiss, Illingworth, Knott, Snow, Underwood amongst its core. The mid-1970s were more turbulent. Illingworth and several others had refused to tour India in 1972–73 which led to a clamour for Illingworth's job by the end of that summer – England had just been thrashed 2–0 by a flamboyant West Indies side – with several England players well over 35. Mike Denness was the surprising choice but only lasted 18 months; his results against poor opposition were good, but England were badly exposed as ageing and lacking in good fast bowling against the 1974–75 Australians, losing that series 4–1 to lose the Ashes. Denness was replaced in 1975 by Tony Greig. While he managed to avoid losing to Australia, his side were largely thrashed the following year by the young and very much upcoming West Indies for whom Greig's infamous "grovel" remark acted as motivation. Greig's finest hour was probably the 1976–77 win over India in India. When Greig was discovered as being instrumental in World Series Cricket, he was sacked, and replaced by Mike Brearley. Brearley's side showed again the hyperbole that is often spoken when one side dominates in cricket. While his side of 1977–80 contained some young players who went on to become England greats, most notably future captains Ian Botham, David Gower and Graham Gooch, their opponents were often very much weakened by the absence of their World Series players, especially in 1978, when England beat New Zealand 3–0 and Pakistan 2–0 before thrashing what was effectively Australia's 2nd XI 5–1 in 1978–79. The England team, with Brearley's exit in 1980, was never truly settled throughout the 1980s, which will probably be remembered as a low point for the team. While some of the great players like Botham, Gooch and Gower had fine careers, the team seldom succeeded in beating good opposition throughout the decade and did not score a home Test victory (except against minnows Sri Lanka) between September 1985 and July 1990. Botham took over the captaincy in 1980 and they put up a good fight against the West Indies, losing a five match Test series 1–0, although England were humbled in the return series. After scoring a pair in the first Test against Australia, Botham lost the captaincy due to his poor form, and was replaced by Mike Brearley. Botham returned to form and played exceptionally in the remainder of the series, being named man of the match in the third, fourth and fifth Tests. The series became known as Botham's Ashes as England recorded a 3–1 victory. Keith Fletcher took over as captain in 1981, but England lost his first series in charge against India. Bob Willis took over as captain in 1982 and enjoyed victories over India and Pakistan, but lost the Ashes after Australia clinched the series 2–1. England hosted the World Cup in 1983 and reached the semi-finals, but their Test form remained poor, as they suffered defeats against New Zealand, Pakistan and the West Indies. David Gower took over as skipper in 1984 and led the team to a 2–1 victory over India. They went on to win the 1985 Ashes 3–1, although after this came a poor run of form. Defeat to the West Indies dented the team's confidence, and they went on to lose to India 2–0. In 1986 Mickey Stewert was appointed the first full-time England coach. England beat New Zealand, but there was little hope of them retaining the Ashes in 1986/87. However, despite being described as a team that 'can't bat, can't bowl and can't field', they went on to win the series 2–1. After losing consecutive series against Pakistan, England drew a three match Test series against New Zealand 0–0. They reached the final of the 1987 World Cup, but lost by seven runs against Australia. After losing 4–0 to the West Indies, England lost the Ashes to a resurgent Australia led by Allan Border. With the likes of Graham Gooch banned following a rebel tour to South Africa, a new look England side suffered defeat again against the West Indies, although this time by a margin of 2–1. If the 1980s were a low point for English Test cricket then the 1990s were only a slight improvement. The arrival of Graham Gooch as captain in 1990 forced a move toward more professionalism and especially fitness though it took some time for old habits to die. Even in 2011, one or two successful county players have been shown up as physically unfit for international cricket. Creditable performances against India and New Zealand in 1990 were followed by a hard-fought draw against the 1991 West Indies and a strong performance in the 1992 Cricket World Cup in which the England team finished as runners-up for the second consecutive World Cup, but landmark losses against Australia in 1990–91 and especially Pakistan in 1992 showed England up badly in terms of bowling. So bad was England's bowling in 1993 that Rodney Marsh described England's pace attack at one point as "pie throwers". Having lost three of the first four Tests played in England in 1993 Graham Gooch resigned to be replaced by Mike Atherton. The lack of a genuine all-rounder to bat at 6, Ian Botham having left a huge gap in the batting order when he had retired from Tests in 1992. Alec Stewart, a sound wicket-keeper and an excellent player of quick bowling, could not open and keep wicket, hence his batting down the order, where he was often exposed to spin which he did not play as well. Alec Stewart took the reins as captain in 1998, but another losing Ashes series and early World Cup exit cost him Test and ODI captaincy in 1999. This should not detract from the 1998 home Test series where England showed great fortitude to beat a powerful South African side 2–1. Another reason for their poor performances were the demands of County Cricket teams on their players, meaning that England could rarely field a full strength team on their tours. This eventually led to the ECB taking over from the MCC as the governing body of England and the implementation of central contracts. 1992 also saw Scotland sever ties with the England and Wales team, and begin to compete as the Scotland national team. By 1999, with coach David Lloyd resigning after the World Cup exit and new captain Nasser Hussain just appointed, England hit rock bottom (literally ranked as the lowest-rated Test nation) after losing in shambolic fashion to New Zealand 2–1. Hussain was booed on the Oval balcony as the crowd jeered "We've got the worst team in the world" to the tune of "He's Got the Whole World in His Hands". Central contracts were installed – reducing players workloads – and following the arrival of Zimbabwean coach Duncan Fletcher, England thrashed the fallen West Indies 3–1. England's results in Asia improved that winter with series wins against both Pakistan and Sri Lanka. Hussain's side had a far harder edge to it, avoiding the anticipated "Greenwash" in the 2001 Ashes series against the all-powerful Australian team. The nucleus the side was slowly coming together as players such as Hussain himself, Graham Thorpe, Darren Gough and Ashley Giles began to be regularly selected. By 2003 though, having endured another Ashes drubbing as well as another first-round exit from the World Cup, Hussain resigned as captain after one Test against South Africa. Michael Vaughan took over, with players encouraged to express themselves. England won five consecutive Test series prior to facing Australia in the 2005 Ashes series, taking the team to second place in the ICC Test Championship table. During this period England defeated the West Indies home and away, New Zealand, and Bangladesh at home, and South Africa in South Africa. In June 2005, England played its first ever T20 international match, defeating Australia by 100 runs. Later that year, England defeated Australia 2–1 in a thrilling series to regain the Ashes for the first time in 16 years, having lost them in 1989. Following the 2005 Ashes win, the team suffered from a spate of serious injuries to key players such as Vaughan, Flintoff, Giles and Simon Jones. As a result, the team underwent an enforced period of transition. A 2–0 defeat in Pakistan was followed by two drawn away series with India and Sri Lanka. In the home Test series victory against Pakistan in July and August 2006, several promising new players emerged. Most notable were the left-arm orthodox spin bowler Monty Panesar, the first Sikh to play Test cricket for England, and left-handed opening batsman Alastair Cook. The 2006–07 Ashes series was keenly anticipated and was expected to provide a level of competition comparable to the 2005 series. In the event, England, captained by Flintoff who was deputising for the injured Vaughan, lost all five Tests to concede the first Ashes whitewash in 86 years. In the 2007 Cricket World Cup, England lost to most of the Test playing nations they faced, beating only the West Indies and Bangladesh, although they also avoided defeat by any of the non-Test playing nations. Even so, the unimpressive nature of most of their victories in the tournament, combined with heavy defeats by New Zealand, Australia and South Africa, left many commentators criticising the manner in which the England team approached the one-day game. Coach Duncan Fletcher resigned after eight years in the job as a result and was succeeded by former Sussex coach Peter Moores. In 2007–08, England toured Sri Lanka and New Zealand, losing the first series 1–0 and winning the second 2–1. These series were followed up at home in May 2008 with a 2–0 home series win against New Zealand, with the results easing pressure on Moores – who was not at ease with his team, particularly star batsman Kevin Pietersen. Pietersen succeeded Vaughan as captain in June 2008, after England had been well beaten by South Africa at home. The poor relationship between the two came to a head on the 2008–09 tour to India. England lost the series 1–0 and both men resigned their positions, although Pietersen remained a member of the England team. Moores was replaced as coach by Zimbabwean Andy Flower. Against this background, England toured the West Indies under the captaincy of Andrew Strauss and, in a disappointing performance, lost the Test series 1–0. The 2009 Ashes series featured the first Test match played in Wales, at Sophia Gardens, Cardiff. England drew the match thanks to a last wicket stand by bowlers James Anderson and Monty Panesar. A victory for each team followed before the series was decided at The Oval. Thanks to fine bowling by Stuart Broad and Graeme Swann and a debut century by Jonathan Trott, England regained the Ashes. After a drawn Test series in South Africa, England won their first ever ICC world championship, the 2010 World Twenty20, with a seven-wicket win over Australia in Barbados. The following winter in the 2010–11 Ashes, they thrashed Australia 3–1 to retain the urn and record their first series win in Australia for 24 years. Furthermore, all three of their wins were innings victories – the first time a touring side had ever recorded three innings victories in a single Test series. Alastair Cook earned Man of the Series with 766 runs. England struggled to match their Test form in the 2011 ICC Cricket World Cup. Despite beating South Africa and tying with eventual winners India, England suffered shock losses to Ireland and Bangladesh before losing in the quarter-finals to Sri Lanka. However the team's excellent form in the Test match arena continued and on 13 August 2011, they became the world's top-ranked Test team after comfortably whitewashing India 4–0, their sixth consecutive series victory and eighth in the past nine series. However, this status only lasted a year – having lost 3–0 to Pakistan over the winter, England were beaten 2–0 by South Africa, who replaced them at the top of the rankings. It was their first home series loss since 2008, against the same opposition. This loss saw the resignation of Strauss as captain (and his retirement from cricket). His replacement, Alastair Cook, who was already in charge of the ODI side, led England to a 2–1 victory in India – their first in the country since 1984–85. In doing so, Cook became the first ever captain to score centuries in his first five Tests as captain and became England's leading century-maker with 23 centuries to his name. After finishing as runners-up in the ICC Champions Trophy, England faced Australia in back-to-back Ashes series. A 3–0 home win secured England the urn for the fourth time in five series. However, in the return series, they found themselves utterly demolished in a 5–0 defeat, their second Ashes whitewash in under a decade. Their misery was compounded by batsman Jonathan Trott leaving the tour early due to a stress-related illness and the mid-series retirement of spinner Graeme Swann. Following the tour, head coach Andy Flower resigned his post whilst batsman Kevin Pietersen was dropped indefinitely from the England team. Flower was replaced by his predecessor Peter Moores, but he was sacked for a second time after a string of disappointing results including failing to advance from the group stage at the 2015 World Cup. He was replaced by Australian Trevor Bayliss who oversaw an upturn of form in the ODI side, including series victories against New Zealand and Pakistan. In the Test arena, England reclaimed the Ashes 3–2 in the summer of 2015. – Source: ESPNcricinfo.com. Last updated: 12 September 2018. Source:ESPNcricinfo.com. Last updated: 17 July 2018. Source:ESPNcricinfo.com. Last updated: 6 July 2018. Source:ESPNcricinfo.com. Last updated: 5 March 2019. Source:ESPNcricinfo.com. Last updated: 12 March 2019. Source:ESPNcricinfo.com. Last updated: 12 March 2019. As set out by the ICC's Future Tours Programme, below is England's full international fixture list until the end of the 2019 season. The venues for the home games are in brackets. August to September: 2019 Ashes series, 5 Tests (Edgbaston, Lord's, Headingley, Old Trafford and The Oval). The England and Wales Cricket Board (ECB) is the governing body of English cricket and the England cricket team. The Board has been operating since 1 January 1997 and represents England on the International Cricket Council. The ECB is also responsible for the generation of income from the sale of tickets, sponsorship and broadcasting rights, primarily in relation to the England team. The ECB's income in the 2006 calendar year was £77 million. Prior to 1997, the Test and County Cricket Board (TCCB) was the governing body for the English team. Apart from in Test matches, when touring abroad, the England team officially played as MCC up to and including the 1976–77 tour of Australia, reflecting the time when MCC had been responsible for selecting the touring party. The last time the England touring team wore the bacon-and-egg colours of the MCC was on the 1996–97 tour of New Zealand. Historically, the England team represented 'Great Britain' in international cricket, and Scottish or Welsh national teams played sporadically. Scotland became an independent member of the ICC in 1994, having severed links with the TCCB two years earlier. Criticism has been made of the England and Wales Cricket Board using only the England name whilst utilising Welsh players such as Simon Jones and Geraint Jones. With Welsh players pursuing international careers exclusively with an England team, there have been a number of calls for Wales to become an independent member of the ICC, or for the ECB to provide more fixtures for a Welsh national team. However, both Cricket Wales and Glamorgan County Cricket Club have continually supported the ECB, with Glamorgan arguing for the financial benefits of the Welsh county within the English structure, and Cricket Wales stating they are "committed to continuing to play a major role within the ECB"
In 2015, a report produced by the Welsh National Assembly's petitions committee, reflected the passionate debate around the issue. Bethan Jenkins, Plaid Cymru’s spokesperson on heritage, culture, sport and broadcasting, and a member of the petitions committee, argued that Wales should have its own international team and withdraw from the ECB. Jenkins noted that Ireland (with a population of 6.4 million) was an ICC member with 6,000 club players whereas Wales (with 3 million) had 7,500. Jenkins said: "Cricket Wales and Glamorgan CCC say the idea of a Welsh national cricket team is ‘an emotive subject’, of course having a national team is emotive, you only have to look at the stands during any national game to see that. To suggest this as anything other than natural is a bit of a misleading argument." England's kit is manufactured by New Balance, who replaced previous manufacturer Adidas in April 2017. When playing Test cricket, England's cricket whites feature the three lions badge on the left of the shirt and the name and logo of the sponsor NatWest on the right. English fielders may wear a navy blue cap or white sun hat with the ECB logo in the middle. Helmets are also coloured navy blue. Before 1997 the uniform sported the TCCB lion and stumps logo on the uniforms, while the helmets, jumpers and hats had the three lions emblem. In limited overs cricket, England's ODI and Twenty20 shirts feature the NatWest logo across the centre, with the three lions badge on the left of the shirt and the New Balance logo on the right. In ODIs, the kit comprises a blue shirt with navy trousers, whilst the Twenty20 kit comprises a flame red shirt and navy trousers. In ICC limited-overs tournaments, a modified kit design is used with sponsor's logo moving to the sleeve and 'ENGLAND' printed across the front. Over the years, England's ODI kit has cycled between various shades of blue (such as a pale blue used until the mid-1990s, when it was replaced in favour of a bright blue) with the occasional all-red kit. England are the only team in the history of Test cricket to have secured 100 victories by an innings. England's most prolific opening partnership was Jack Hobbs and Herbert Sutcliffe. In 38 innings, they averaged 87.81 for the first wicket, with 15 century partnerships and 10 others of 50 or more. Five England bowlers have taken four wickets in an over, three of these at Headingley. They were Maurice Allom v New Zealand at Christchurch in 1929–30, Kenneth Cranston v South Africa at Headingley in 1947, Fred Titmus v New Zealand at Headingley in 1965, Chris Old v Pakistan at Edgbaston in 1978 and Andy Caddick v West Indies at Headingley in 2000. Records complete to Test #2346. Last updated 13 February 2019. Records complete to ODI 4103. Last updated 5 March 2019. Win percentages exclude no-results and count ties as half a win. Where applicable, a minimum of 10 innings batted or 100 balls bowled applies. Figures include games up to 10 March 2019. Records complete to T20I #752, 10 March 2019. T+W and T+L indicate matches tied and then won or lost in a tiebreaker (such as a Super Over). Win percentages exclude no-results and count ties (irrespective of tiebreakers) as half a win. These lists show the ten players (or those tied for 10th) with the most appearances for England in each form of the game. The lists are correct up to 10 March 2019. † denotes players who are available for selection and have represented England in the format during the past 12 months. This lists all the active players who have played for England in the past year (since 5 April 2018) and the forms in which they have played, and any players (in italics) outside this criteria who have been selected in the team's most recent squad. It does not include Alastair Cook, who played Tests until September 2018, as he has retired from international cricket. The ECB offers a number of Central Contracts in September each year to England players whom the selectors think will form the core of the team. Players can now gain contracts for Test and White-Ball (Limited-Over) cricket and in some cases both. Other players who play enough games during the year can also gain Incremental contracts. At the start of each season the ECB present the England Men's Cricketer of the Year award to "recognise outstanding performances in all formats of international cricket over the past year", voted on by members of the cricket media. The England cricket team represents England and Wales. However, under ICC regulations, players can qualify to play for a country by nationality, place of birth or residence, so (as with any national sports team) some people are eligible to play for more than one team. ECB regulations state that to play for England, a player must be a British citizen, and have either been born in England or Wales, or have lived in England or Wales for three years. This has led to players who also held other nationalities becoming eligible to play for England. The qualification period for those born outside England and Wales has varied in the past, but in November 2018 the ECB announced that the period would be reduced to three years in all circumstances, in line with ICC regulations. Of the current squad (see above), Jason Roy was born to British parents in South Africa and Keaton Jennings was born in South Africa to a British mother – both had to fulfil residency requirements. In addition, Chris Jordan, Ben Stokes and Tom Curran have British citizenship, having lived in England since their youth, while Eoin Morgan also holds Irish citizenship. Curran's younger brother, Sam, was born in the UK, so did not have to have to undergo a qualification period. ICC regulations also allow cricketers who represent associate (i.e. non-Test-playing) nations to switch to a Test-playing nation, provided nationality requirements are fulfilled. In recent years, this has seen Irish internationals Ed Joyce, Boyd Rankin and Eoin Morgan switch to represent England, whilst Gavin Hamilton previously played for Scotland – though Joyce, Rankin and Hamilton were later able to re-qualify for and represent the counties of their birth. ^ "About the ECB". England and Wales Cricket Board. Retrieved 29 November 2016. ^ "MCC History". MCC. Retrieved 7 October 2007. ^ "Records / England / Test matches / Result summary". ESPNcricinfo. Retrieved 20 November 2015. ^ "Records / One-Day Internationals / Result summary". ESPNcricinfo. Retrieved 17 July 2018. ^ "Records / England / Twenty20 Internationals / Result summary". ESPNcricinfo. Retrieved 1 April 2015. ^ a b "England v Australia 1864 – 1888". ESPNcricinfo. 19 September 2006. Retrieved 5 February 2008. ^ "Australia in England 1880". Wisden. Retrieved 5 February 2008. ^ Williams, Marcus (6 November 2002). "The Ashes in The Times". The Times. London. Retrieved 5 February 2008. ^ a b "England in Australia, 1882–83". Wisden. Retrieved 5 February 2008. ^ "Australia v England". Wisden. Retrieved 5 February 2008. ^ "Test matches". ESPNcricinfo. Retrieved 5 February 2008. ^ "South Africa v England". Wisden. Retrieved 5 February 2008. ^ "England v Australia 1890 – 1914". ESPNcricinfo. 27 September 2006. Retrieved 5 February 2008. ^ "Australia v South Africa". Wisden. 14 February 2006. Retrieved 5 February 2008. ^ "Sri Lanka vs England, 4th quarter-final ICC World Cup 2011". 26 March 2011. ^ "Kevin Pietersen: Batsman's England career over". BBC Sport. 4 February 2014. Retrieved 4 August 2014. ^ "ECB Annual Report and Accounts 2006" (PDF). England and Wales Cricket Board. Archived from the original (PDF) on 27 September 2007. Retrieved 7 October 2007. ^ "Establishment of a Welsh Cricket Team". BBC Democracy Live. 23 October 2013. ^ Shipton, Martin (12 August 2013). "A Welsh national cricket team? AMs will have their say on the possibility this autumn". walesonline. Retrieved 21 March 2016. ^ Wyn-Williams, Gareth (14 March 2015). "Welsh national cricket team should be set up says Rhun ap Iorwerth". northwales. Retrieved 21 March 2016. ^ Shipton, Martin (23 October 2013). "Should Wales have its own international cricket team, ask Assembly Members". walesonline. Retrieved 21 March 2016. ^ Williamson, David (7 September 2008). "Call for Wales to have its own cricket team". walesonline. Retrieved 21 March 2016. ^ "New Balance announced as Official Kit Supplier". England and Wales Cricket Board. Retrieved 7 May 2017. ^ "Classic World Cup Kits 1996". Archived from the original on 3 July 2017. Retrieved 5 July 2017. ^ "Classic World Cup Kits 1999". Archived from the original on 19 June 2017. Retrieved 5 July 2017. ^ "England's ODI kits down the years". The Daily Telegraph. ^ "List of cricket grounds in England and Wales". ^ Most Runs for England, ESPNcricinfo Retrieved on 26 January 2016. ^ Highest Batting Averages, cricinfo.com Retrieved on 13 February 2019. ^ "Most ducks for England". ESPNcricinfo. Retrieved 13 February 2019. ^ "Records / England / Test matches / Result summary". ESPNcricinfo. Retrieved 13 February 2019. ^ "Records / England / One-Day Internationals / Most matches as captain". ESPNcricinfo. Retrieved 4 October 2009. ^ "Records / England / ODI matches / Result summary". ESPNcricinfo. Retrieved 5 March 2019. ^ "Test and White Ball central contracts offered by England". ECB. Retrieved 29 September 2016. ^ "ESPN Cricinfo – England ODI/Twenty Shirt Numbers". ESPNcricinfo. 18 May 2005. Retrieved 1 August 2013. ^ "ECB announce central contracts for 2018/19". ECB. Retrieved 28 September 2018. ^ a b "England Cricketer of Year Awards 2013–2014". Archived from the original on 8 March 2016. ^ "Joe Root and Charlotte Edwards named England cricketers of the year". The Guardian. ^ "Flintoff & Brunt win annual award". 8 May 2006. Retrieved 8 September 2018 – via news.bbc.co.uk. ^ "Swann named cricketer of the year". 24 May 2010. Retrieved 8 September 2018 – via news.bbc.co.uk. ^ "ECB award for Trott". Retrieved 8 September 2018. ^ "ECB announces winners of England Cricketer of Year Awards for 2011–12". Retrieved 8 September 2018. ^ "The International Cricket Council Player Eligibility Regulations" (PDF). 18 September 2013. Retrieved 22 January 2015. ^ "Jofra Archer could play for England at World Cup after ECB amend eligibility rules". ESPNcricinfo. Retrieved 29 November 2018. Waghorn, H T (1899). Cricket Scores, Notes, etc. (1730–1773). Blackwood. Wikimedia Commons has media related to England national cricket team. This page was last edited on 21 April 2019, at 00:33 (UTC).